Slipped capital femoral epiphysis is a displacement of the upper femoral epiphysis on the metaphysis. It occurs in about 1 in 50,000, most commonly in obese boys. SCFE is bilateral in about one-fourth of cases, with possibly slight silent slippage in even more. The cause of SCFE is complex. In early adolescence, the growth plate is relatively weaker, as evident from the incidence of physeal injuries at other sites at this age. The hip is vulnerable, as it carries about four times its body weight. Retroversion or a reduced neck shaft angle may increase the verticality of the plate, making it mechanically less stable. The risk is further increased by any constitutional disorder that adds to this physeal weakness. Endocrine disorders, such as hypothyoidism, hypopituitarism, or hypogonadism, and metabolic disorders, such as rickets or treatment with radiation or chemotherapy, may contribute. If obesity or trauma is added to this, the plate may fail—gradually, acutely, or as a combination of gradual and acute components. Failure of physis and slipping may occur from age 6 years until the plate is fused. Most slips are gradual over a period of many months. Often the progress on the slip is variable; acute episodes are superimposed on gradual slipping. Closure of the plate as the result of treatment or as it occurs naturally at the end of growth halts the process. Following slipping, remodeling may reduce the deformity. The risk of osteoarthritis is increased when the slip is more severe, the child is older, and especially if avascular necrosis complicate management. Patients with SCFE have a normal acetabulum, and the articular cartilage is often preserved. Thus, despite the presence of significant deformity, many do well for many decades. Chondrolysis cause early degeneration. An enigma is the significance of the pistol grip deformity. This deformity is often seen in males who develop osteoarthritis. Speculation is that this deformity is secondary to unappreciated SCFE. Why such mild deformity should cause early degeneration is unclear, however. The diagnosis of SCFE is made more difficult because the onset of the common chronic slip is insidious and the pain is often referred to the knee. Knee pain occurring between the ages of 6 years and maturity should promote an evaluation of the hip. Long-standing slips will produce an out-toeing gait, an abductor lurch, and limb atrophy. Screening is done with a hip rotation test. Radiography The diagnosis of SCFE can nearly always be made on conventional radiographs of the pelvis. The AP radiograph usually shows widening of the growth plate and rarefaction of the adjacent metaphysis. Sometimes these are the only findings, and the condition is called a “preslip.” Subtle displacement is identified by a loss of the normal relationship at the epiphysis–neck interphase. On the AP radiograph, assess severity by the percentage of contact between the head and neck. For a more accurate assessment, obtain a true lateral view and measure the slip angle. Other imaging Pinhole lateral bone scans will show increased uptake in preslips. Ultrasound imaging will demonstrate the “step off” at the site of displacement. The MRI shows AVN or altered head position. Atypical slips Underlying disorders that weaken the physeal plate or increase the loading may increase the risk of involvement. Bilateral involvement increases the possibility of some problems. Often a history of some endocrine or renal or special treatment is given. The objective of management is to stabilize the growth plate to prevent slippage and to avoid complications. Achieve this by a screw, pins, epiphysiodesis, or immobilization with a spica cast. Unstable Slips Five to ten percent of all slips cause instability and increase the risks of avascular necrosis. They occur suddenly, causing an inability to walk. Because the slip is unstable, any movement of the leg causes pain. Unstable slips are often more severe than gradual slips. Management is difficult and controversial, and the outcome is sometimes poor. Acute management choices include traction, manipulation, cast immobilization, acute decompression, reduction, and fixation. Mounting evidence suggests that early decompression and fixation reduces the risk of AVN. Admit the patient. Arrange for screw fixation. If the procedure is delayed, consider applying skin traction with the limb supported on a pillow. Reduction may occur from traction or when the limb is in position in the operating room for fixation. Fix as with a stable slip. Supplement the fixation with a second screw if the first pin is not optimal or if the patient is obese or even more unreliable about self-care than most adolescents. Encourage bedrest for 3 weeks and then nonweight-bearing activity until early callus is seen. Follow up to observe for AVN. Stable SCFE Fix mild and moderate stable slips in situ with a single screw. In the child under age 8 years, fix with smooth pins to allow growth. Classify as stable or unstable. Positioning Place the patient on a radiolucent table. Make certain that satisfactory imaging is possible for both AP and lateral views before starting the procedures. In the large, obese adolescent, this may be difficult. Determining position for pin entry Using guide wires, mark lines on the skin projecting optimal pin position for both the AP and lateral views. With greater degrees of slip, the entry point in the neck will become more proximal and anterior. Fixation device Cannulated screws simplify fixation by allowing placement of a guide pin over which the fixation device may be placed. Guide wire placement Prep the skin at the site the lines intersect, make a stab skin incision and place the guide wire in under imaging visualization. Alternately monitor position by switching from the AP and lateral projections. Be certain to achieve accurate placement. Confirm accurate positioning by observing the position while imaging through an arc of motion that includes maximal profiling of the proximal femur. Pin fixation Ream the femoral neck and head over the guide wire. Place the guide wire deep enough to avoid nonintentional removal when removing the reamer. Insert the cannulated screw at a depth that is short of joint penetration but deep enough to provide 3–4 threads to engage the femoral head. After treatment Walking is allowed as tolerated. Pin removal is usually not necessary. Follow to ensure growth plate fusion and to monitor opposite side for possible slipping. Because the risk of avascular necrosis is great in unstable SCFE, open the joint to drain the hematoma and fix securely. Joint decompression This is best achieved by opening the joint as soon as possible following the slip. Reduction Adequate reduction is usually achieved by the act of positioning the leg in preparation for pinning. This positioning involves internal rotation and adduction of the limb. Avoid overreduction, as this increases the risk of AVN. Fixation Fixation is often adequate with one pin if good position and purchase are achieved. Add a second pin if fixation is tenuous. After treatment Protect with bed rest for 3 weeks and keep nonweight-bearing until callus is seen radiographically. Follow clinically for evidence of AVN by limited motion and radiographic changes. 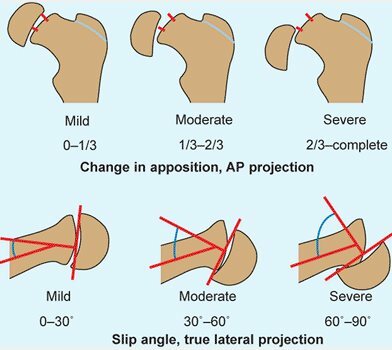 Slips >60° may cause persisting disability and be indications for corrective osteotomy. The simple flexion osteotomy has been shown to correct the deformity with little risk to femoral head vascularity. Procedure Through a lateral approach, expose the intertrochanteric portion of the upper femur. From the measure of slip angle, determine the degree of correction. Place a right-angle nail-plate in the upper fragment at an angle to the shaft equaling the slip angle. Perform an osteotomy just below the blade-plate entry site. Flex the distal fragment to align the plate with the femoral shaft. Minimal rotational correction may be necessary. Fix with 3–4 cortical screws. After treatment Avoid weight-bearing until union is solid. Removal of the plate is usually not necessary. Osteotomy The procedure can occur at several different levels. In general, osteotomies closest to the site of deformity provide the most anatomic correction but the greatest risk of avascular necrosis. The following are the operative choices. Cervical osteotomy This shortening valgus osteotomy is made at the site of deformity, providing excellent correction. Due to the risk of causing avascular necrosis, this procedure is usually performed only by surgeons with considerable experience with the technique. Fixation is simple. Base of the neck osteotomy This provides safety with good correction, as the procedure is extracapsular and relatively close to the deformity. Any prominences are shaved off. Fixation is simple. Intertrochanteric osteotomy This is extracapsular, and contact surfaces are large, providing stability and rapid healing. Fixation is more complicated, and the osteotomy is distant from the site of deformity. Subtrochanteric osteotomy Because the osteotomy is most distal and fixation more difficult, this procedure is not commonly performed. The base of the neck or the intertrochanteric osteotomy levels are preferred because correction is good and risks are minimal. Prophylactic pinning Bilateral slips occur in about one-fourth of patients. Always carefully evaluate the apparently uninvolved side. Pin the other side if an early slip is suspected or if some underlying metabolic disorder, such as renal osteodystrophy is present. Other factors that increase the risk for the other hip to slip are an age under 10 years and severe obesity. Severe slips Severe slips complicate management. In situ fixation Plan fixation, allow remodeling to correct deformity and follow with an osteotomy to improve motion should that be necessary. Marked displacement makes in situ fixation difficult. Make the point of entry for the screw on the anterior aspect of the femoral neck. This allows central placement of the pin in the displaced femoral epiphysis. Initial osteotomy The more difficult approach is to perform an osteotomy that includes correction of the deformity and stabilization of the slip. Stabilization may be achieved by placing fixation across the physis or positioning the physis in a horizontal position. Complications are common in SCFE. Avascular necrosis is a serious complication that often follows management of unstable slips. Do everything possible to prevent this disastrous outcome. Avoid manipulative reductions. AVN is a serious complication that often follows management of unstable slips. In unstable slips, consider emergency drainage and pin in the position that results from traction or operative positioning. Follow the patient’s progress clinically. Be suspicious if hip rotation becomes guarded or progressively more restricted. Necrosis is usually clear radiographically in 6–12 months, or earlier on MRI studies. If AVN occurs, remove or exchange protruding pin(s), prescribe crutch walking, and encourage motion with activities such as swimming. If the AVN is only partial, attempt to salvage function. Procedures such as drilling or coring are not effective. Fuse the hip if pain and disability are unacceptable. Avoid fusion techniques (such as cobra plates) that jeopardize the outcome of conversion to a prosthetic joint later in life. Chrondolysis may occur with or without treatment. Joint penetration by guide pins or screws is a doubtful cause. The joint space narrows, hip motion decreases, and an abduction contracture often develops. Relieve weight bearing and encourage motion. The value of aspirin, hospital traction, and capsulotomy is uncertain. Most improve with time. Rarely, the disease progresses to joint destruction. The combination of chondrolysis and AVN is devastating and usually ends in hip fusion.